• New interface. The interface gets more modern still, and more user-friendly. A toolbar contains the main functionalities of the software and an inspector simplifies choosing the song and tracks settings. • Performance and ease of use. Software startup and file loading have been enhanced. Scrolling and zooming are now both smoother. The install/update process is also improved. • High resolution. The software is compatible with high resolution screens (Retina and HD) and touch screens. • Quality of the score's design. The score-display engine has been entirely rewritten for even more realistic, professional sheet music. • New musical notation elements. Notation now includes golpe, pick scrape, and dead slap. The writing of bends in standard notation has been enhanced, and we have improved the management of conflicts between the various elements of the score. • Tablature for all tracks. In addition to fretted instruments like guitars, standard notation gets automatically transposed into tablature — this on all tracks, including piano, voice or drums. • Connect your guitar to Guitar Pro. Plug your guitar into an external sound card connected to Guitar Pro and apply to it the effects exactly as they have been modeled for any track in a given file. • Polyphonic tuner. Simply brush down the six strings together to check their tuning in a single stroke. • New instrument banks. Many sounds have been added, including the dobro, flamenco, manouche, and 7-string nylon guitars, the electric sitar, fretless bass, jazz double bass, accordions, mellotron, harmonicas, bagpipe, new synthesizers, and drum machines. • Stereo sounds. You can choose between mono and stereo for all acoustic instruments, as well as add automatic spacialization to drumkits. • Simplified audio adjustments. Choose and modify your sound from over 1000 presets combining a soundbank and an effects chain. • Mixing MIDI/RSE. Guitar Pro 7 makes it possible, within any given single file, to mix tracks that use MIDI tones with others that use RSE tones. • Virtual fretboard and keyboard. The virtual-instrument (guitar, bass, banjo, and piano) windows are resizable. • Lock your files. You may lock your file to prevent any accidental modification. You may also add a password to it, to keep it from being opened or edited. • New audio-export formats. MP3, FLAC and Ogg formats are available when exporting RSE (Realistic Sound Engine) tracks. It is also possible to export all tracks separately in a single operation. • MIDI and MusicXML formats. 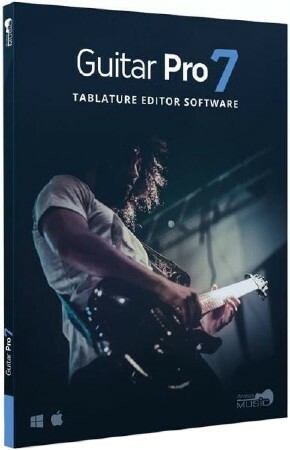 Imports and exports in MIDI and MusicXML formats have been improved for better compatibility between Guitar Pro and other musical software programs.